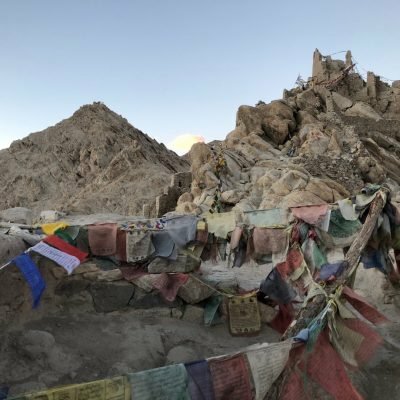 Seven Incredible Days in Ladakh! Ladakh ( known as the “Land of High Passes”) is a region in the Indian state of Jammu and Kashmir that currently extends from the Kunlun Mountain range to the Great Himalayas in the south. 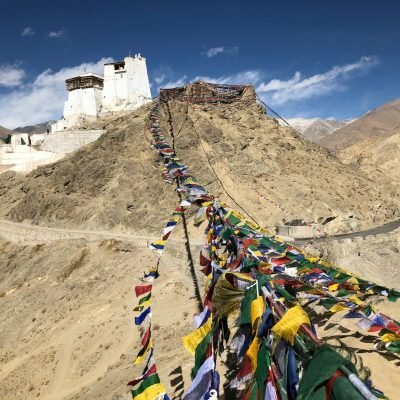 Ladakh is inhabited by people of Indo-Aryan and Tibetan descent and is one of the most sparsely populated regions in all of India because of its high altitude and extreme weather. The culture and history of this ancient land are closely related to that of Tibet. While the Ladakhi language is different from Tibetan, about 60% of the language can be mutually understood by both Tibetans and Ladakhis. Ladakh is renowned for its remote mountain beauty and historic culture. Ladakh is the highest settlement in India and as such the population of this expansive land is a meager 274,289. Among this population there is a mixture of many different ethnic groups, predominantly Tibetans, Monpas, Dards and Muslims. In 1979, the Ladakh District was divided into the Leh District (mostly occupied by Tibetan Buddhists) and the Kargil District (mostly occupied by Shi’a Muslims). Life in Ladakh is mainly characterized by rhythms of spirituality because the native people have been devoutly faithful to its ancestral customs and traditions. Life here is simple and relatively untouched by the fast pace of technology and development that is so endemic across the rest of India. In the winter, hot water is hard to come by, and any running water at all (including flushing toilets or running faucets) is even harder to find. Leh, the capital of Ladakh, just got its first major provider of high speed internet in 2018 and most homes in the region still use wood and dung stoves for heat. The architecture in Ladakh exhibits strong influences from Tibet and India and many homes and structures are made from a simple construction of rammed earth and sticks. The culture of Ladakh is mystical and is quite similar to Tibetan culture. The most popular cuisines of Ladakh, mostly of Tibetan origin, are Thukpa (noodle soup), Momo (meat or potato dumplings) and Tsamba (Barley flour porridge) . Religious mask dances play an important part of Ladakh’s cultural life and religious ceremonies. The traditional music of Ladakh includes the folk instruments like the Surna and the Daman (a type of shenai and a drum). Ladakh is a highly charged spiritual center and I was most excited to unearth its secrets in my 7 days of travel. This was to be the 10th wedding anniversary celebration for my wife and I. We started our marriage thru-hiking 2,650 miles of the Pacific Crest Trail from Mexico to Canada in 2008. 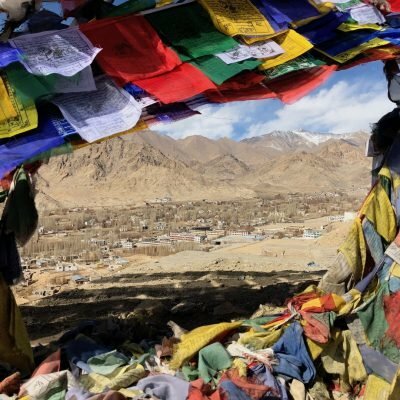 Now, 10 years later, we felt that Ladakh was the perfect place to represent the life we have lived together since that time on the Tibetan Plateau. This was both a shared adventure for our family and a new experience for all of us to enjoy the culture and grandeur of an ancient land. As our plane touched down in Leh IXL airport we were immediately surrounded by gnarly mountains. The tallest of these mountains just around 30km from town is 6,150 meters / 20,177 feet. I had read that the only way to access Leh in the winter time is by airplane. It is literally closed off to the rest of the world by road because the high passes are too icy and too high to be crossed safely in the winter. During the summer months there are many Indian tourists who drive over the pass from Srinagar but in these lonely winters the whole town shuts down and 97% of all hotels and business close their doors. 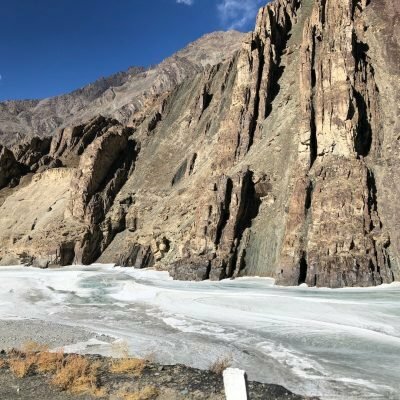 The entire industry of Leh is focused either on a very short burst of tourism in the mild summers OR a large contingent of Indian military bases who work year round to protect the well guarded border with Pakistan. Looking at these snowy 5000 meter/ 16,400 feet jagged mountains that surround the town I could see why nobody was coming in or going out on the roads. This is a desolate, isolated place. The flight attendant announced that the air temperature is -7 Celsius outside. While that is certainly in the range of cold, below-freezing weather, I was still surprised. The travel agency that was hosting us had told us it could get down to -25 Celsius during the day so I was prepared for something quite Siberian (it turns out that it did later actually get that cold on the high passes outside of town). We had to get off the airplane and get onto a bus that drove us to the airport arrivals building. I stepped outside with no jacket and instantly felt the rush of the mountain wind. We crammed into an old 1980’s jalopy bus and it rattled across the tarmac with several Indian travelers standing up in the aisle. We were almost certainly the only white people in the whole military-style rickety bus. I was surrounded by huge men with whispy mustaches. These men had a hardiness- something that speaks of legend and bravery- of life in the Himalayas. As we walked into the tiny airport in Leh (which literally had one door to get in the airport and only a solitary gate where all the flights board) it at first felt familiar because it was decorated with red paint and the colorful treasure vases and gems of Tibetan Buddhism. I had seen this type of decor a 1000 times on the other side of the Himalayas in Tibet. The columns all resembled those of a Tibetan monastery with the eternal knot and other Tibetan religious icons swirling around the pillars. In fact, it felt more like a small countryside monastery or a home then it did an airport. Except for the singular turning luggage carousel this could have been a well furnished restaurant (except there was no food to purchase here and the whole space was freezing). The tall, steel, restaurant-style space heaters that you see on an outside patio at in upscale Italian bistro- these were scattered around the inside of the airport and passengers wearing all their winter jackets were all bundled around them like campers around a bonfire. I had never before seen an airport that was so cold that you needed space heaters to keep from freezing as you picked up your luggage from baggage claim. My wife took the luggage off the carousel amidst the disorganization of everyone trying to get their luggage at once. Meanwhile, I headed about 50 feet over to the exit hall where there were luggage carts strewn about willy-nilly. As my hands gripped the metal bar of the cart I was shocked. This was probably the coldest metal I had ever touched in my life and we were still inside the airport. 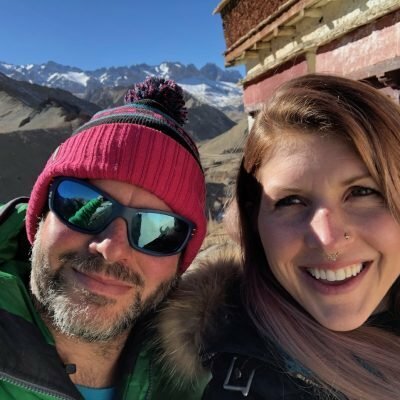 My wife and I placed our luggage on the chilly cart and as we did we tuned into the repeating loud speaker announcement that was continually saying that we needed to rest for our first 24 hours because of the severe altitude. We were certainly happy for that advice as we had woke up at 4:00am to catch our 6:40am flight from New Delhi DEL to Leh IXL. We wanted nothing more than to hit a comfy bed and curl up for a long winter’s nap. Rinchen, owner of Atisha Travels, recognized me as I filled out my arrival form (compulsory for all foreigners) and patted me on the shoulder with a warm welcome. I had not even left the baggage claim area and somehow my tour organizer was standing next to me. I guess in a small town of 30,000 people a guy like this knows everyone and can just stroll through security to pick up his guests. I was also a little taken aback by the fact that he immediately knew my face even though we had never met before. I guess there were not too many other foreign faces in the crowd so it was an easy process of elimination. We hopped into the white Toyota Innova van that would be our faithful mountain companion for the next 7 days. This is apparently the nicest vehicle you can buy in all of Ladakh and is the standard for most private foreign tourist groups. In America, it would be a mid-end family mini van. But here among the clunky army trucks and the Indian Tata tractor trailers this is seen as a luxury vehicle. The Toyota Innova is the Mercedes of Ladakh. 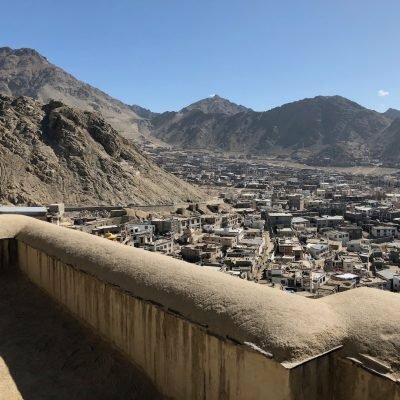 Because the town is so small we drove 20 minutes and we had already passed the airport area military bases, downtown Leh, and were now on the opposite side of town. We arrived at a little alley way with a modest metal signed painted with the words “Shanti Guesthouse”. We walked through an outside stone-walled corridor and were in the lobby of one of the only places that were still open in the winter. 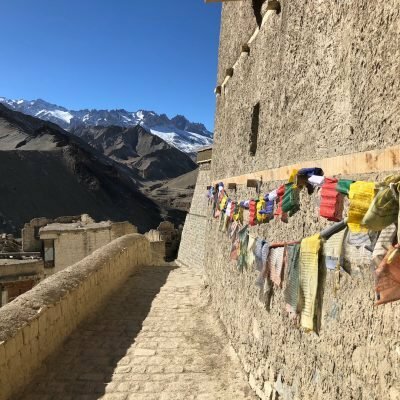 While almost every other hotel and tour operator had packed their bags to vacation on the warm beaches of Goa, Southern India, Nicky and her crew at the Shanti Guesthouse stuck around to brave the brutal winters and host Indian and foreign tourists who were preparing to walk on the frozen Zanskar River. This is an epic 100km walk over a frozen ice sheet that takes around 10 days to complete. 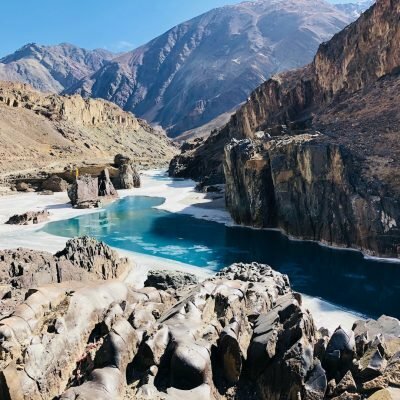 This trek is known globally as the Chadar Trek and the small amount of tourists permitted to walk this savagely cold river represent most of the groups coming through in the dead of winter in January and February. This means that Shanti Guesthouse with its 30 rooms was fully booked out every single night while we were there. Much of the only other accommodation available was in local Homestays (which are much more rustic than this official hotel). We arrived at the Guesthouse at 9am. It was still early but we all felt totally bushed. They let us partake of their amazing Indian buffet breakfast and then let us take a mid-morning nap in an unoccupied hotel room while they prepared our room. Our whole family snuggled under a giant fluffy white duvet and had an amazing sleep. In the afternoon we drove to the downtown area and had Tibetan momos and Thukpa noodle soup in one of the few restaurants still open in the winter. Then we took a short drive 10 minutes above town to Shanti Stupa (there is also a series of about 400 steps you can walk up from the bottom of the Guesthouse but we opted for the car ride as we had our kids with us). The Shanti Stupa was a gift from Japan and has an amazing overlook into the nearby mountains. 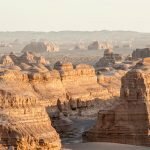 I was eager to photograph the surrounding mountains and this was the perfect place to jump into shooting some of the most incredible panoramas. We returned to the guesthouse in the mid afternoon and after a nice buffet dinner at the Shanti Guesthouse, our family headed in for an early night. Everything was exhausting. I felt like I had to take a nap every time I walked up the 12 marble steps to our second floor guest room. Everything I did at that altitude took the breath out of my lungs and left me gasping for air. Even bending over to tie my shoes got me out of breath and this simple task took about 5 minutes to complete because I had to take a break a few times. I felt like a 85 year old man who had been smoking his whole life. Yet I had never smoked and was in relatively good shape and I was only 36 years old. Like many first nights at altitude, I did not sleep well. That first night in Leh, I was laying in bed for 12 hours but only 7 hours of that time allowed me much sleep. At one point I woke up and was terrifically thirsty for water because of the severe dry climate. I wanted to listen to an audiobook and drink some water to bide the long uncomfortable night, but it took an hour for me to lean over and grab my headphones and my water bottle because I was in such a daze. I was neither awake nor asleep, my head throbbed and I felt like I was in some form of foggy sleep purgatory. I can only imagine how the mountaineers on Mount Everest feel at the top. They must be very disoriented and confused in both their waking and fitful sleeping. The only actual activity we managed this first day was a brief 15 minute car ride up to the Shanti Stupa and a 200 meter stroll around downtown. Yet that minimal amount of activity had thoroughly worn us out in our first 8 hours at 3,500 meters/ 11,483 feet. 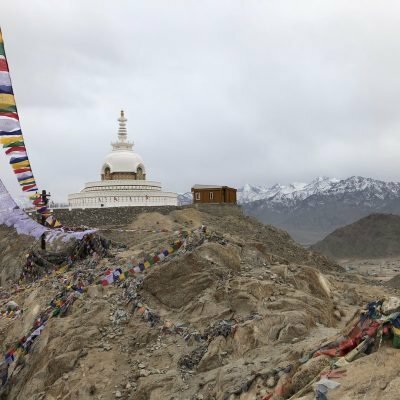 Based on this experience, I highly recommend doing nothing in your first 24 hours in Leh. The lady on the airport intercom was absolutely right! We had a late morning and ate breakfast at 9am. 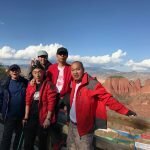 We met Tenzin, our driver and guide for the week, at 10am and took off to the Leh Palace. Then we drove through the downtown area of Leh and up a winding overlook sitting above Leh. It was only a 15 minute drive and suddenly we were climbing the steps up into the dark, mud-daubed halls of Ladakh’s iconic Leh Palace. Ladakh is well known for tall medieval-looking imposing palaces sitting high up on vertical, lofty cliffs. I was eager to see and photograph these extremely picturesque fortresses hovering above the valleys like untouchable sentinels. But I was surprised to see that such a Palace was just right above the town of Leh. We were right over the town and the view was incredible! And, best of all, we had the whole palace to ourselves in the winter low season. Leh Palace is one of the most important historical monuments of the Ladakh region. Modeled on the Potala Palace of Lhasa in Tibet, this 9-story royal palace was built by King Sengge Namgyal in the 17th century. But later in the 19th century, the royal Ladakhi family abandoned the palace when the Dogra kingdom took control over the Ladakh region. 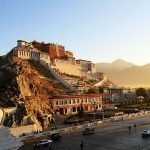 The design and architecture of the palace is similar to the Potala Palace and it resembles the fine Tibetan architectural style with high sloping walls that slope inward at a precise 85 degree angle thrusting upward into the sky like a series of chimneys from a Charles Dickens novel. The dark, relatively unlit interior of the palace is decorated with beautiful motifs and murals and remains rather primitive and rustic. Walking inside the Palace, it is easy to feel that even for royalty this was a stark and cold place with few creature comforts. The palace is open to the public and the roof provides fantastic panoramic views of Leh and the surrounding areas. The real highlight of the Leh Palace is winding up through creaky old wooden steps through 9 floors of low ceilings and narrow hallways. I truly felt like a kid exploring his grandma’s attic for the first time and somehow the passage was leading me not only back in time but to further into the discovery of a mythical Narnian land. I have to truly say that I enjoyed the exploration of the fairy tale palace as much as my kids as they eagerly climbed the steep steps to the top. There are several places along the way to stop and take photos on many of the different levels of the Palace, including some medieval open windows where you can actually stand on a barely supported balcony if you dare to step out of the window and onto the ledge. From the top of the Leh Palace there is an excellent view of the 6,150 meter mountain, Stok Kangri, in the Zanskar mountain range. There are excellent views across the Indus Valley to the south, with the Ladakh Mountain range rising behind the palace to the north. After about 1 hour exploring the Leh Palace we drove around the corner to the slightly higher neighboring Namgyal Tsemo Monastery. Founded in early 15th century, Namgyal Tsemo monastery is renowned for its three-story high solid gold idol of Maitrieya Buddha. 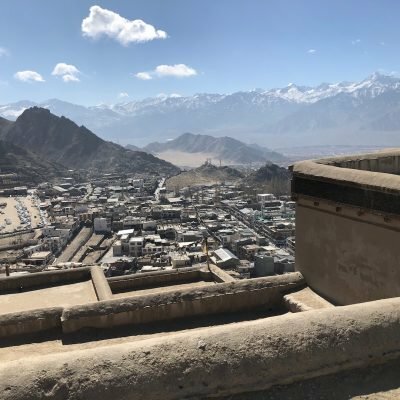 Situated on a mountain top behind the Leh palace, the monastery offers similar views as the nearby Leh Palace but from a slightly higher and wider vantage point. The gompa was founded by King Tashi Namgyal in 1430 AD who was a major follower of Buddhism. As a mark of his respect to Buddhism, the king built the partner monastery above his palace. Situated at the cliff of Namgyal hill, its architecture is impressive. The view of Leh from the gompa is breathtaking as the view changes with light. For this reason Namgyal Tsemo monastery is a favorite with photographers. Down the hill side there is the Shankar Gompa which is also associated with Namgyal Tsemo monastery. It is a daily ritual followed by monks to walk from the Shankar Gompa to worship Buddha and light butter lamps at Namgyal Tsemo. There is actually a mountain path from Leh Palace that runs up into the saddle where Namgyal Tsemo Monastery sits. This is about a 30-40 minute walk and many either walk up or down between the monastery and the Palace. If you do take the path rather than driving between the 2 points be warned that you should take steps very slowly and with deep breaths. Overexertion, even on something as simple as a 30 minute hike, can really hit you later on in the day and may make you really feel the first signs of Acute Mountain Sickness or AMS. After seeing Leh Palace we had a terrific Indian lunch back at the the Shanti Guesthouse and had a rest. In the afternoon we drove 30 minutes to Shey Palace and had a terrific view of the colors of sunset as they danced over the Leh Valley and highlighted the snowy mountain tops. We drove another 15 minutes to our guide’s house, right between Tiktsi Monastery and Shey Palace. This was hands down one of the highlights of our journey as we got to experience true Ladakhi hospitality and participate in making authentic momos. This was a process that involved rolling the dough out, cutting it in circles, and stuffing the dough with a delicious mixture of pork and special spices and herbs. Our hosts steamed the momos and we had a delicious dinner! Of course, the ones we rolled out didn’t look as good as the perfectly pinched folds of their professional dumplings but, nonetheless, they were all very tasty! It was an incredible night spent laughing and drinking Chai tea by their warm fireplace and I have to say it was really on that night that I so fell in love with the warmth and kindness and good humor of the Ladakhi people. We left our delightful hosts at 11pm and were back at our guesthouse by 11:30pm for a much better night sleep than we had had the previous night. Now we were getting better acclimatized and our breathing was a little less troubled than the night before. Every day we ventured a little further from the town of Leh out into the true wild beauty of Ladakh. On this 3rd day we started to feel a little bit more ourselves and generally started feeling better acclimated. From Leh we drove 3 hours to Lamarayu Monastery. Along the way we stopped at Alchi Monastery. 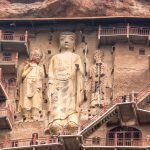 This is a very special monastery because it records the history of Tibetan Buddhism BEFORE it moved into the Tibetan Plateau. Most of the monasteries we saw in Ladakh were created when Buddhism moved from India to Tibet and then returned back into India. But this monastery is from the 11th century and predates much of the the movement of the teachings of the Buddha before it moved north across the Himalayas. After a 15 minute walk down a small alley way through a very tiny village, we arrived in the middle of Alchi Monastery. From a position of size this was not much to look at. There must only have been a handful of monks that still take care of this old countryside monastery. While I have been in monasteries in Tibet that hold thousands of monks and you can hear the roar and bellow of chanting and drums and horns, the only sounds that whispered about Alchi Monastery were the tinkling of a few windchimes and the pittering songs of chirping sparrows. This was a peaceful place. What Alchi Monastery lacks in size in makes up for in history and character. The woodwork from the stupas and the few small temples (each little bigger than a quaint wooded cottage) bears definite fingerprints of Indian architecture. The wood is dark and stained with years under the bright sun and the the lattice work on the windows is definitely different from the carvings on any other Tibetan Buddhist monastery I have ever seen. Even the main stupa in the monastery courtyard had features that were markedly different from those on the Tibetan Plateau. This stupa has a cave built inside of it where you can walk in under the holy relics inside. Essentially there is a small 2 meter high stupa within the greater 7 meter tall stupa and you can walk in under the smaller (and assumedly holier) stupa. There is a small set of prayer wheels around the monastery and we took the quick 10 minute kora around the compact complex. On the far side of the kora we passed a single pilgrim walking around the monastery clockwise. I stopped as the pilgrim passed and climbed a fenced wall to get a peek into the nearby the flows of the legendary Zanskar River. From there I saw a perfect turquoise blue river that was flowing under a massive vertical cliff face. This view alone made Alchi Monastery so worth it. Altogether we spent about 35 minutes around the monastery. You can pretty much take the whole thing in about 20 minutes because of its size. We departed Alchi and drove another 1.5 hours on our way to Lamarayu Monastery. Along the way we drove by the confluence of the Zanskar River and the Indus Rivers. It was stunning to see where the glacial ice meets at the convergence these two rivers. Seeing these two rivers pour into one was like watching two brilliant turquoise snakes intermingling and mating and shedding their skins and scales as they merged into one larger churning snake basking against the sunlit backdrop of dramatic reddish mountains with not a scrap of vegetation on them. 20 minutes before we got to the monastery we stopped at a landscape that is literally called the “Moonland”. This is an all yellow and brown landscape that has mountains and hills that arise out of the ground like a network of burgeoning bubbles. There must be 1000’s of tiny humps and ridges (at least they looked tiny to us from far away) and they all sit within a 1 mile area on top of each other like some alien super colony of termites. I am not exactly sure what the surface of the moon really looks like, but I can only imagine that the first astronauts there must have experienced something close to this in the eerie sense of barren unfamiliarity as they stepped out of their moon rover for the first time. After a few pictures of the Moonland, we dropped down to 9,500 feet to Lamarayu Monastery. This was, ironically, the lowest altitude we were at in our entire stay in Ladakh. Lamarayu Monastery is one of many picturesque monasteries that sits perfectly perched high atop a steep hill. 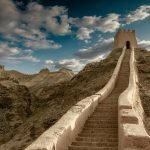 In fact, the location of the monastery doesn’t just make for a great picture, it truly evokes wonder that long before cranes and backhoes and CAD there were men in the 12th century who climbed these great mountains and built 7 story structures in the highest and most impossible spaces. Just the act of building the monastery seemed like an act of spirtual discipline and determination. The distance we drove from Leh became immediately worthwhile. We spent an hour just walking around this impressive structure and taking 100’s of pictures from every angle as we gazed down across the valley and into the jagged peaks that protect and encircle the monastery like menacing guards. There was something very sacred here and I walked slowly around the high, steep walls of the monastery over the rubble and scattered stones of staircases that had crumbled and fallen over 10 centuries of weather and erosion. 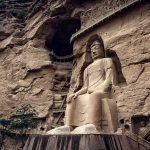 While my wife entered a few temples to look at the ornate Thangka paintings, I walked the perimeter of the monastery like a curious child digging a tunnel through the underbelly of a sand castle. Then we both ascended to the roof of the monastery for more incredible views along a line of lonely flapping prayer flags. It was 360 degrees of jaw dropping beauty up there and I really could have stayed on that roof laying in the sun like a lazy cat all day long. Like Alchi Monastery (and just about every where we went) there was a still reverence here. But this monastery – even more so than the other hill top structures – seemed to also carry a commanding, kingly authority. There was something quite grandiose about this monastery in its geography and in its ancient foreboding walls. This was like a mighty castle looking down on all its subjects in the valley below, confidently certain of its regal position. Feeling the high from a great scenic drive and the inspiring walk around Lamarayu Monastery, we drove back in the direction of Leh town and pulled off the road to stay in homestay just 45 minutes from the hallowed corridors of Lamarayu. We got into the homestay just as the sun was setting and we could feel as soon as it did that the air significantly dropped in temperature from cool and sunny to dark and icy. Fortunately there was an incredible wood fire in the stove burning in the homestay and we were very cozy inside. There we ate yet another filling and scrumptious dinner of homemade Indian food. While there was no hot water (and no heat in our small room) we all had 2 thick blankets on us and were quite cozy and warm in the corner bed room of the homestay. Today we drove from the homestay location to the famous Chadar Trek. We spent much of our time on the road. About 2 hours of this time was actually spent on paved road and then we spent another 5 hours in the back of a Japanese Gypsy SUV bumping our heads against the unpadded roof as we navigated a very narrow and dusty road that winded along the steep canyons that hung 600 meters over the Zanskar River. Probably the most unnerving thing about the road were the places where backhoes were doing construction amidst piles of boulders to help clear and widen the road from treacherous, unpredictable rock fall. It was at these time that, due to the presence of construction on an already tight road, we were no more than a hand’s width away from the unprotected edge on a road that was not much wider than our own car’s frame. The drop below into the river was at least 300 meters and we would have all died instantly if any rock fall or sudden driving malfunctions were to push us over the edge. I trusted our car and our driver and I just tried not to think about that possibility too much as I knew that our guide had driven this bumpy mountain pass many times with many different groups. The Zanskar River was made particularly famous by the BBC documentary called “Human Planet”. 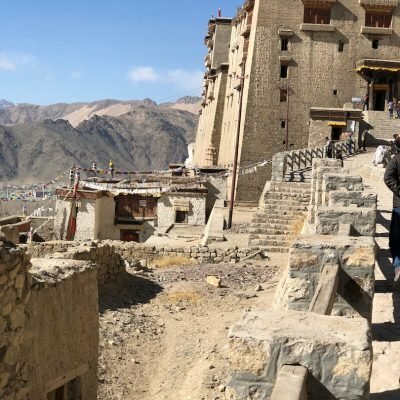 One of the series in the documentary highlighted a Ladakhi girl who had to cross 100 km of the river to get from her father and mother’s humble dirt-walled home to her small boarding school so she could start her semester with her classmates. The journey across the ice looks particularly daunting and several times she walks with her father across crackling, dangerously thin ice so she can make it to her studies. The particular climax of the whole episode is where most of the ice on the river has melted and there remains only a narrow, life threatening sliver of ice as the single passage along the bottom of the steep canyon walls. Every conceivable path is blocked for this little girl except a thin sheet of ice that is clinging to the side of the river bank; all the rest of the river is surging with the terrible current of fast-flowing, hypothermia-inducing melt water. There is only a small margin of ice less than half a meter wide for the girl and her father to belly crawl under an overhang so she can make it to school. The young girl bravely and faithfully follows her father’s experienced movements through the narrow ice passage and she squirms to an area that is more stable and well protected. Ultimately, the girl heroically makes it to her school for the year without any incidents. But the whole affair leaves the viewer with a sense of awe that so many sacrifices and challenges are undertaken just to make the commute to elementary school. 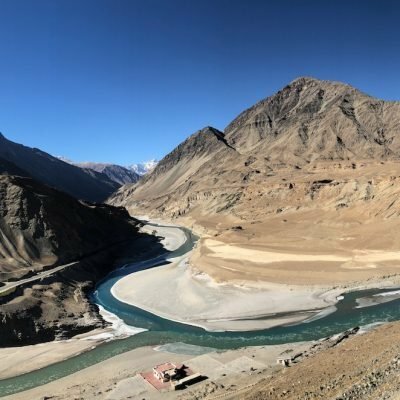 Since this famous scene in BBC’s “Human Planet”, thrill-seeking curious trekkers have found their way to the north of India to see and discover the river for themselves. For these reasons, the Chadar Trek (which means “Ice Trek” in Ladakhi) is like no other trek in the Himalayas. Like the girl’s journey in the film, this trek involves walking on a frozen sheet of glass that is ever shifting and creaking above the current of the waters underneath it. Dramatic mountains rise on both sides of the river adding to both the beauty and the danger. While the trek does not gain much altitude because you walk along the icy surface of flat river, it almost feels like an expedition to the North Pole where the temperatures drop down to -35 degrees Celcius at night. 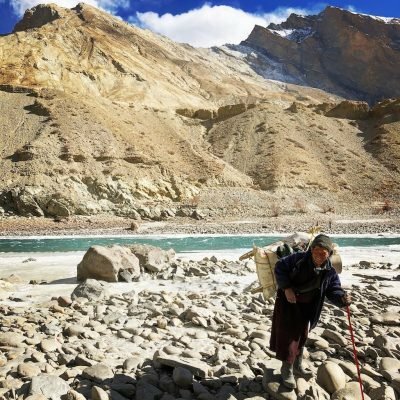 The food rations are transported on improvised wooden sledges by local Ladakhi porters and the trekkers find their lodging in such wild and strange places as caves along the rivers’ edge and by beaches littered with sharp ice wedges and snow crevasses. The trek allows you to get to know the Zankari culture up close through the lense of locals and their hospitality. One of the highlights of the trek is the magnificent Nerak Waterfall that is frozen completely from top to bottom. The best (and only) time to do this trek is from mid-January to mid-February. That is when the Zanskar river freezes and the ice is thick enough to walk across – at least for most of the trek. There are a few sections where the trekkers actually have to traverse the canyon walls like mountain goats on the crags in order to avoid thin or non-existent ice and the rowdy whitewater currents of the below surging river. I had seen the “Human Planet” documentary and, like many watchers, I was immediately taken by this alluring, bewitching icy serpent. 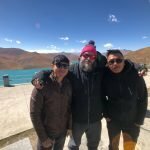 I had even been planning to take my family on the full 10 day trek up and down the Zanskar River and had determined that I would pay a local Ladakhi porter to pull a sled with my kids on it so they did not have to walk across the slippery ice. When I presented this plan to my wife she was not so keen. 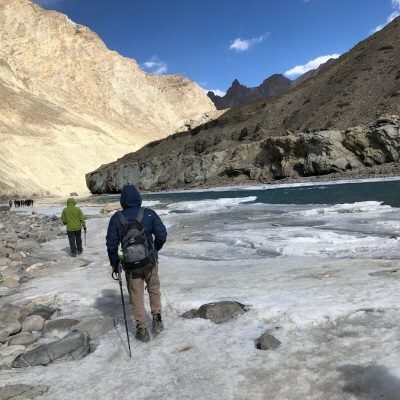 Having talked to locals, we realized that trek was realistically safe enough for our children, especially under the watchful and experienced eye of local Ladakhis who knew exactly where to step for the best passage on the ice sheet. But I think the real sticking point for our children would have been the blistering cold. It is one thing to walk on a river as an adult in -25 Celcius because we’d be producing some body heat in our movement. But for kids to sit on an ice sledge in that kind of weather and then to spend the night in an uninsulated tent on the ice felt a little imposing for us. 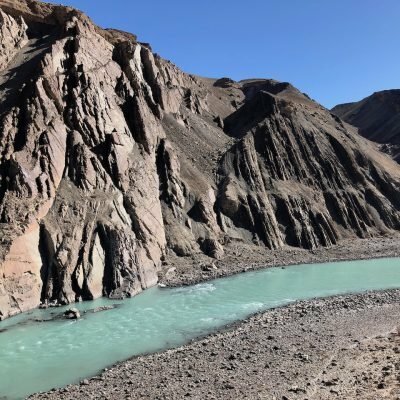 My wife, though, is pretty adventurous so she did compromise with me to at least go out and see the Zanskar River close up. So we opted to make a day trip out of it so at least we could have fun sliding about on the ice without having to commit to 10 days of relentless cold. As soon as we got out of the car and skidded across the ice, my wife looked at me with a big smile and said, “I wished we had done all 10 days with the kids!” Once we were out there we could see that whole trek was well organized and well equipped. There were fancy cook tents that provided hot meals every night for the trekkers and private bathroom tents and meeting tents that housed each and every expedition. Every day, the government of Ladakh allows exactly 100 trekkers to be out on the ice. These trekkers are usually divided between 5-10 different expeditions, most of which are comprised of Indian travelers who want to walk on the ice. After being on the ice and hanging out by one of the main base camps for a few hours, it was easy to tell that most of these native Indians were wealthy suburban tourists who were looking to get out the busyness of Delhi or Mumbai to have an adventure. These were regular people – doctors, accountants, taxi drivers- and seeing those regular people out doing something extraordinary really made me feel like our family could have probably done the whole trek. My wife and I both agreed that with the right ultra thick and warm sleeping bags (which can be rented from the Chadar Trek expeditions), we could have managed the trek with our kids. But, in the end, we were totally fine that we did not do the whole trek. After all, it gave us something to come back for. The day we spent out slipping and sliding on Zanskar River was precious. Our kids had a blast throwing huge chunks of ice into parts of the exposed river. And we even got to borrow a little miniature sleigh to pull them along the ice. They loved every minute of it and it was really quite sunny and warm out on the ice under the afternoon sun. After playing on the ice, we drove back to Leh and got into the Shanti Guesthouse for a nice night in the heat of the hotel’s working radiator. And boy did a hot shower feel good that night! Despite the perceived (but probably not actual) danger of the Chadar Trek, there was something that was haunting me far more than walking on shifting ice. I had heard about the highest motorable road in the world. 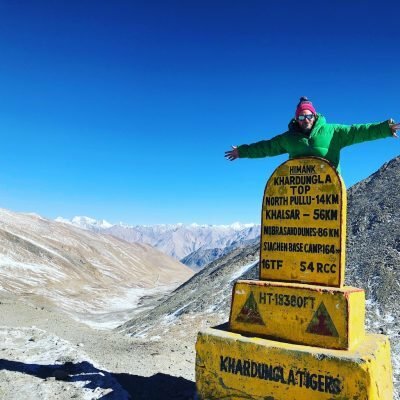 And I had even watched a few YouTube videos as cars drove carefully over the packed snow and ice on tires covered with chains and with nothing on the edge of the road to protect them from sliding off into a Himalayan abyss. And it all sounded pretty gnarly to me. 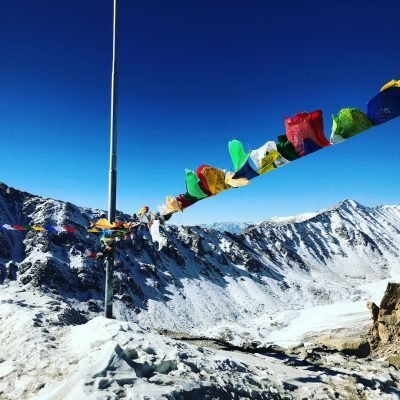 The Khardung La is a dirt-road pass that crosses over an elevation of 5,600 meter / 18,300 feet. After driving over some pretty narrow mountain roads myself in Tibet, it wasn’t the steep drop off that really concerned me. It was that I was bringing my family to an elevation higher than any we had been to before. 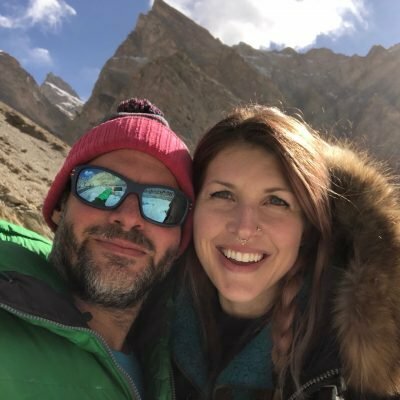 My wife and I had climbed to over 17,000 feet around Lhasa before we had kids, and living on the Tibetan Plateau our kids had even been to 14,000 feet a few times with us on family backpacking trips. In all these conditions we had all done very well in regards to health and acclimatization. But 18,300 feet was a whole new level. This was starting to get up near the top of North America’s tallest mountain, Mount Denali. This was the stuff of epic mountaineers and crampons and oxygen tanks. But through a lot of research and planning and after many talks with our experienced tour agency, we decided that it was possible. Our kids were, after all, no more likely to get Acute Mountain Sickness than any other adult. We just were not sure if they did start to feel nauseous up there how they would react. 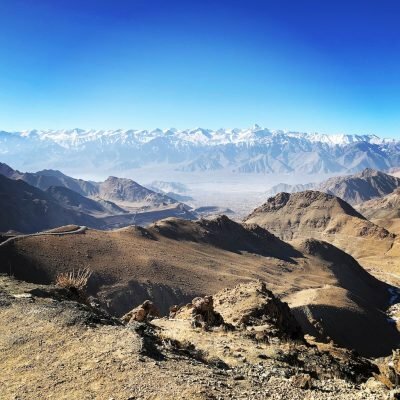 But we did know this: we had spent plenty of time acclimating in and around Leh, we had emergency oxygen in the car if we did run into any disconcerning situations, and the best cure for any altitude related sickness is to descend quickly to a lower altitude. Since we were driving up from 11,500 feet to 18,300 feet in a matter of about 2 hours we knew we could descend pretty quickly in our car along the road. So with those contingencies in hand, we set out to drive over the world’s tallest motorable road with our two children. As we drove up, I kept glancing at the back seat looking for headaches or other signs of discomfort. Other than our son feeling a little sleepy, we got up to the high pass without any incident. And, of course, we snapped a few selfies on the top and we did not spend much time up there in that rarified air because we wanted to descend quickly. All in all, I was very proud of my family for doing so well and we all felt very good considering the winding roads and the high altitude. All my fears about the big high pass were put to rest. And then came the really fun part. 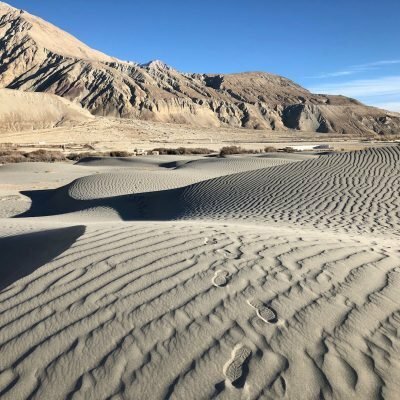 As we descended from the Khardung La into the Nubra Valley, we could see large stretches of sand before us. There was, too, a river that braided in and out between the piles of sand as it wove into the foot the hovering mountains. As we crept down in altitude, the whole valley opened up into a flood plain full of blowing dust. This was the famous Nubra Valley, famous for the indigenous fuzzy two-humped Bactrian camels that lived there. These camels were some of the only animals in the world who could survive in both the extreme cold and lack of water. There were obviously quite specialized to make it at 10,500 feet in one of the driest, toughest places in the world. Once at the bottom of the valley, we visited Diskit Monastery and the statue of India’s largest future buddha. This statue had to be at least 30 meters tall and it sat on a golden throne that overlooked the entire expansive desert valley. From the future buddha statue we drove through long stretches of highway into the real heart of the Nubra Valley right smack into the rolling sand dunes. At around 5 meters high, these dunes were certainly not anything near the size of the dunes you might see in the Sahara Desert. But there was a very certain texture on them that made them enchanting. The wind blew the sand into an intricate pattern of miniature waves and ridges that almost made the dunes look like they were covered with crochet work. After jumping into the dunes and rolling down them like we were lost raiders fleeing desperately in the desertscape of planet Jakku in Star Wars, we headed to a remote desert camp. After about an hour drive we arrived at this camp and had a wonderful soak in their hot springs tubs. The water was so hot (being directly piped from the ground) that we had to wait two hours for it to cool off before we could even get in it. But our whole family eventually had a wonderful bath and that was a great way to wash all the sand off our bodies from jumping about the sand dunes. With an incredibly relaxing hot springs bath we were all very relaxed and clean! That night we slept awesome! Day 6 was our last full day in Ladakh and we definitely took advantage of every daylight hour. We woke up in our VIP hit Springs Camp and had a warm cup of Chai and jumped in the van. The sun was just cresting the snowy peaks and the soft morning light played on the new morning snow. We drove back to the small town where we had lunch the day before and ate a simple breakfast of eggs and Indian bread. Knowing that we were going to be a long way from civilization on our drive out to Pangong Lake, I wanted to stock up on Snacks and drinks for the 8 hour car ride ahead of us. I stopped in a very small convenience store in a town of about six single-room concrete-block buildings (which altogether had probable total population of around 15 locals) set out in the middle of the Nubra Valley desert. Half of the buildings in town were buried under 3 meters of rubble and trash because of a recent flood that had surged through the floodplain of this desert valley. Desert landscapes are not used to receiving large amounts of precipitation or snow melt and this basin had fully been washed out and submerged in a recent deluge. The town was already very forlorn and rustic looking and having the few buildings in it being destroyed by a flash flood made it even more lonely. To add to the desperate feeling, there was a pack of 10-15 starving wild dogs who roamed the 50 meter-long strip in town looking for food scraps. They were all quite scraggly and were constantly biting and arguing about the pecking order of the group. Just the day before, our guide Tenzin was attempting to feed these wily dogs and had gotten bit pretty severely on his left hand. The dog bite bled on his finger and we were unable to find any Tetanus or rabies shots in the nearby town of Diskit. So a caution to travelers: do not feed the wild stray dogs and be careful to keep your fingers and your food close to your body. Some dogs may be aggressive enough to try to take food from your table or from your hands so have your radar up and do not leave your food unattended. I was curious what the small dark convenience store had in the way of supplies. I was really just hoping for a few bottles of water and some Snickers. The convenience store had a strange assortment of goods from chips to laundry detergent to pots and pans and plastic flowers. I knew I was in the middle of nowhere when the only bottle of water that was for sale in the whole dimly lit store was an already used half-filled bottle. They obviously had no water for sale. I bought a few juice drink packages of sickly sweet mango syrup juice and hoped that would be enough to stave off thirst and headaches as we drove over another 5,400 meter/ 17,716 foot pass back to Leh. For snacks there were no Snickers. But they had some dried lentil beans which turned out to be quite tasty. So another warning: When traveling to Nubra Valley and Pangong Lake, I recommend bringing 2-3 days of water in your car because bottled water can be hard to find. As it was, there was no place for us to get clean water for around 24 hours so we had to live off the few almost empty bottles we already had in the car and those sweet box drinks. We turned out to be okay but we were definitely cutting it pretty close in regards to hydration at altitude. It was another 4 hours drive to Pangong Lake across the vast seas of rolling high desert. There were moments when the winds had completely covered the single track road with drifting sand and we had to drive over newly formed and ever shifting sand dunes in an attempt to find the other side of the road where the pavement continued several 100 meters out. And there were times the road just totally ended without warning and we found ourselves skirting disheveled fields of rocks with no clear path. Apparently in the summer lots of temporary tents pop up offering souvenirs and snacks in this area of Nubra Valley. But in the winter season this was a truly wild, forgotten place. We did not see another single car or a person for hours. One time I saw a lonely Ladakhi nomad walking by himself on the road and I found myself wandering wherever this man could have come from or where he was walking to. There seemed like no point of reference for his journey as we hadn’t seen a town or anything resembling a house for an hour. We arrived at Pangong Lake around 2pm. There was no one else out on the whole lake except us. The only two people we could see from a distance were two local Ladakhis wearing ice skates and hockey gear who were hitting an ice hockey puck around on the frozen lake. It was strange to see signs of western development and recreation out there in the wilderness. But what I did not know at that moment was that the crowds were already preparing to gather around the shores of the frozen lake for a world record breaking Guinness Book of World Records event. Just the next day was to be the competition for world’s highest ice hockey game. Unfortunately we missed this game by a day since we had to fly out but apparently most of India’s Olympic hockey team is drawn from the ranks of local Ladakhis who love love and cherish the sport! Pangong Tso (Tibetan: སྤང་གོང་མཚོ) is Tibetan for “high grassland lake” (“Tso” is the Tibetan word for “Lake). This an endorheic lake in the Himalayas situated at a height of about 4,350 m (14,270 ft). It is 134 km (83 mi) long and extends from India into China. 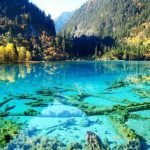 Approximately 60% of the length of the lake lies in China and 40% of the lake is in India. The lake is 5 km (3.1 mi) wide at its broadest point. All together it covers 604 km2. During winter the lake freezes completely, despite being saline in nature. It is not a part of the Indus River basin area and is geographically a separate land locked river basin. The brackish water of Pangong Lake has a very small amount of hardy micro-vegetation. Reportedly, there are no fish or any other aquatic life in the lake, except for a few small saltwater-tolerant crustaceans. The lake is in the process of being identified as a wetland of international importance under the Ramsar Convention. As such it will be the first trans-boundary wetland in South Asia under this convention. In the summer the waters of the lake are a brilliant blue and this is said by many to be India’s prettiest lake. However, the lake in winter lacks the bright colors of summer and gray ice stretches across the shores and the rim of the lake is spotted with brown vegetation and is chilled by piercing winds that rush across the flat surface. But there is still a rugged beauty here in the silence of winter. In winter the Indian army drives their trucks across the lake to reach remote outposts that protect this disputed border. We drove from Pangong Lake back to Leh without stopping too much. On the way back to Leh, we crossed India’s second highest motorable road at 5,400 meters / 17,716 feet. As we descended the high pass back into the Leh Valley the sun was setting right in front of us on the ridges and peaks that stand over Leh. It was a perfect view of dancing pinks and oranges that eventually faded into misty purples and then the ink black night sky. This was our last night in Ladakh. We got up early in the morning to fly out of IXL Leh airport. As I mentioned before this is a very small airport. Because it is so small I figured there would not be much time spent in getting from one place to another and I thought we could get through security in 1 hour. Thankfully our guide told us we really needed a full 2 hours to make it the 50 meters from the entrance to the flight departures gate. I was, at first, a little skeptical of this warning, but the whole place is actually very chaotic and it literally took us the full two hours from our drop off at the airport to the time we were at the airplane gate. Be aware that in India (or at least in Leh) there are several extra steps in flying out that we do not have in America. The following list shows exactly why we took 2 hours to make our way through a building that was no bigger than a hometown grocery store. There is exactly 1 door to get in the airport from the freezing cold weather outside. Everyone was standing in the freezing cold at 6:30am in the dark parking lot in a confused gaggle (remember that Indians do not celebrate the concept of an orderly “queue”, so you may need to push your way to the front). There were so many army soldiers all crowded about the doorway all ready to leave their military posts to go home and see their family. Fortunately, a kind airport attendant let us in the front of this mob of people because we had kids with us. Then once we were through the door we had to go through the presecurity check outside of check in to enter into the airport. Here they examine your bag and after it goes through a X-Ray machine they tag it. Strangely, at this presecurity check they ask for your flight ticket – which is unusual because you do not even get your ticket until you go into the airport and check your bags at the desk of your airline. So I was a bit taken aback by this but I was able to pull up my itinerary on my email on my phone. So make sure you have a paper or electronic copy of your flight reservation handy as they will ask for this. After your luggage goes through the X-Ray machine they throw your luggage into a jumbled pile of 100’s of bags. Note to travelers: There is no order and all the bags get completely buried here so make sure when you sort through the pile to find all your luggage so that you do not forget small bags like laptop cases, purses, or backpacks which could get easily misplaced in the mess. This is what you would expect to be the most normal, standardized process in the whole airport. You walk up to your airline counter and you hand them your passports. The airline attendant taps a few things on her computer and she prints out your boarding passes and voila! – you are free to fly! But the Leh airport was not quite that simple. As we were standing in line all sorts of people started to cut in line in front of us. This included a ton of army people. When we finally got up to the counter they took all of our 5 large bags and put them on the conveyor belt weigh station at one time. Apparently Air India weighs the total of your bags rather than each bag individually so they want to weigh them at the same time. Therefore we had 5 suitcases tottering on that small scale next to the check in counter for all 4 of us. As the rules were explained to us, you get 25 kg per person on Air India (that could be divided between 20 bags or 1 bag- it does not matter to them ). It took the flight desk about 20 minutes to find our ticket in their system and during that time the power went out in the airport and my poor son was left in the bathroom with no light to see. Eventually the Air India Staff was able to locate our reservation and we did actually get tickets. In the meantime our whole family bought a few cups of Chai and hoped that somehow they had not goofed our online reservation. One of our hand bags/carry on items did not have a bag tag from the presecurity checks. So when I went to go through security the official there made me turn around and go all the way back to the front door to get a baggage tag. What I did not understand was that these bag tags were all the same generic tags that had the company logo. Every tag was identical and had no individual bar code or cereal number to identify this as a special bag or even your own personal bag. But for some reason they would not let me through without this useless piece of paper dangling from my bag. I suspect this is arbitrary proof that my bags had been through the outside X-ray pre-security screen and they accidentally missed tagging my bag in the chaos. Which, of course, is arbitrary proof that the whole process could do with a little streamlining. So I dragged my tired son back across the airport and we tagged his little child suitcase and then we were allowed to go through security. At this point my wife and daughter had already gone through the second security screen and were waiting on the other side for us with a Indian pastry filled with microwave-warmed chicken. After you have put your carry on bags through a second redundant X-Ray machine you have to physically go outside in the freezing cold by the airplanes and see where all the checked bags are coming out. Again, the checked bags are lying in a pile and, for some reason, you must positively identify that, yes, your bags have in fact travelled the small length of the carousel and are sitting next the airport bus that will take you to your plane. I suspect this is because the airport is so disorganized and chaotic that they have lost bags somewhere around this point and need people to make sure that nothing got lost on the hidden conveyer belt from check in to the time you get on the plane. (Or this might be an added layer of security). There is only one departures gate in the whole airport. Right next to this gate there is a sign that says “To Gates” and points left. So it would appear that you are to follow the ambiguous arrow to your gate. But actually the sign just points you to walk into a wall and there is really nowhere to go. For some reason this sign is basically placed directly over the one single gate. In fact, if you are standing at the sign close enough to see it’s words, you are already in line to board your plane and therefore have no reason to follow the sign. By this one gate there is no flight info listed on a screen to tell you which flight is boarding. There were 100 army soldiers in civilian clothes waiting in line, so I just figured we could joined in that line. So like a sheep following the flock, I just got in line. Because there was no flight board or announcement I accidentally got in the wrong line. But eventually we figured out that this was the flight boarding before ours. I guess this is the problem with only having one gate. You might be in the right place, but you never know which flight you are actually in line for. That first line was boarding a flight to Delhi. We got in the next line at the same gate which flied out to Chandigarh. Just like the bus on our arrival this was an old jalopy that had standing room only. But the people of India are so hospitable that they gave our family some of the last remaining seats so our kids did not have to stand on the moving bus. In summary, the Leh airport takes a long time to get through. 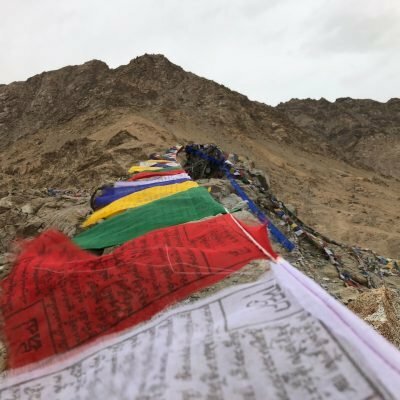 If you are flying in or out of Leh expect that there will be about 2-3 extra steps in the check in process and a lot of people (mostly military) milling around the airport. So leave yourself lots of time and expect mid amounts of disorder. But once you are in the airplane what you can expect is the most terrific views of the Himalayas below you (and a lot of turbulence in the first 20 minutes of your flight). Ladakh offers many highlights and opportunities to see the raw breadth of the immensity of Himalayas. 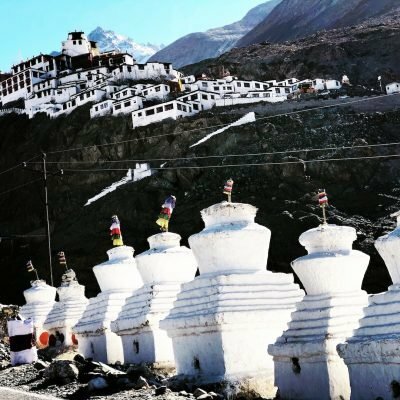 It is fitting that as you fly out from this mountain mecca that you pass over the very mountains that have given Ladakh its remote and untouched character. As I watched the mountains pass away into the clouds I knew I would come be back to this land of mountains, monasteries, and mysteries. One time was really just not enough! 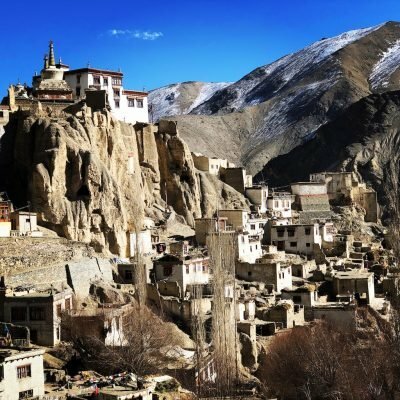 Thanks for reading our story and hope it helps you along your own travels to Ladakh! 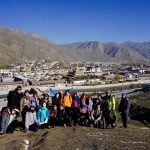 Keep coming back for more travel and trekking tips!